Why Do the Really Big-Screen TVs Cost So Much More? So, your heart is set on a really big-screen TV--say, 75 inches or larger. You're lucky enough to have the wall space to accommodate a panel that big, and you even have permission from your spouse to go for it. But then you go online or drive over to your local TV retailer to compare models, and you experience sticker shock over just how much those few extra inches actually cost you when you go past the 65-inch mark. It's no secret that the price of LED-backlit LCD TVs has, in general, significantly declined over the past few years, be they HD or now UHD models. As a result, it's become much more affordable for the average U.S. consumer to buy a TV in the 55- to 65-inch range. While the pricing on TVs larger than 65 inches has also declined, those larger sets still remain out of range for many consumers. Interestingly, the price difference between a 55-inch TV and a 60-inch TV, or a 60-inch TV and a 65-inch model, is often relatively small. The same can't be said for the price difference between a 65-inch model and a 75-inch one ... and the price difference tends to get much more hefty when you compare a 75-inch model to an 85-inch (or larger) one. As an example, just look at the pricing on the current Samsung 4K TV UHD TVs, as listed through the company's website. On April 29, if you wanted to buy a 55-inch MU8000, it would cost you $1,299.99 (as part of a $200-off sale). If you wanted to get the 65-inch version of that same TV, it would cost you $2,199.99. A $900 increase is a considerable amount of money, to be sure, but it's not outrageous. However, if you wanted to step up from the 65-inch model to the 75-inch one, it would cost $3,499.99--an increase of $1,300. As one advances up the Samsung 4K TV product line, especially where there's models even larger than 75 inches, the price difference to get extra inches becomes even more glaring. For instance, in the company's new QLED TV line, take a look at the flagship Q9. To buy the 65-inch SKU would cost a hefty $5,999.99 However, if you wanted to move up to the 75-inch model, you would have to cough up an extra $4,000 to $9,999.99. If you think that's a crazy premium for an extra 10 inches, hold on to your seat (or at least your couch cushion). Take a gander at the price tag on the 88-inch UN88KS9810 SUHD TV: While the 78-inch model sells for $7,999.99, the 88-inch SKU jumps all the way up to a mind-boggling $19,999.99. And that's peanuts when you consider that Samsung's 105-inch curved 105S9 UHD TV costs a mere $149,999.99. So, what gives? Why does it cost so much extra money to get those extra inches? "It can mainly be attributed to production capacity and yield," Brandt Varner, vice president of TV product marketing at Samsung, told us. He didn't respond to our request to elaborate on his response. However, the analysts stepped in and explained it to us in much greater detail. "The simple answer to the cost question has to do with manufacturing efficiency of the panels," explained Paul Gagnon, director of TV sets research at IHS Markit. He added that certain screen sizes are "optimized for production in certain LCD fab 'generations.'" Fab is industry lingo for fabrication plant. As an example, he noted that 55-inch LCD panels are "very efficiently produced" in the eighth-generation LCD fabs, "so their cost is much lower" than that of larger screen sizes. He added that there are about 20 of those eighth-generation fabrication plants. In comparison, producing 60-inch and larger LCD panels efficiently "requires a larger fab," but there's only a single tenth-generation fab in operation now that is efficient at making 60-, 70- and 80-inch LCD panels, Gagnon explained. Bigger screen sizes, including 65- and 75-inch screens, are made on smaller-generation LCD fabs "relatively inefficiently," he said, adding: "We will have to wait until more of the Gen 10 category LCD fabs come online in the next five years for costs to drop more significantly for these larger sizes." Largely agreeing with much of Gagnon's take, Chris Chinnock, a display industry veteran who owns Insight Media, told us by email: "It is all about manufacturing. Each generation of LCD fab is optimized for a certain size." As examples, he pointed to data supplied by Display Supply Chain Consultants (DSCC) that showed generation 7 fabs can efficiently produce 40- or 46-inch panels, eight panels to a substrate or six panels to a substrate. "As the generations and substrate size increase, you can efficiently produce larger panels." He noted that, because there are many gen 7 through gen 8.5 fabs, 55-inch panels are "fairly common." Conversely, there are "much fewer larger-generation fabs, so supply is more limited." The combination of limited supply and efficiency of production means that panels above 65 inches become increasingly more expensive. Where Chinnock parted ways with Gagnon was on forecasting how long it will take for the pricing of larger-sized TVs to significantly decline. Chinnock believes that "the trend is clearly toward larger and larger substrate sizes, so the size where prices take off will continue to move toward bigger size, but it takes time." He predicted it will be "much less" than five years to see prices drop on TVs larger than 65 inches. Another factor in all of this is the reality that there has not traditionally been a whole lot of demand for TVs above 65 inches, especially ones nearing or passing the 100-inch mark. "Larger sizes are an issue because of their size and install issues," Chinnock said. In short, many consumers just can't fit an 88-inch or larger TV on their wall--or anywhere else, even if they're not mounting it. And they are harder to mount and more likely to require installation costs. Most consumers also can't fit such a monstrosity in their cars--which means that, if you're buying one, you can also tack on the cost to have it delivered. Ross Young, CEO and founder of DSCC, echoed Gagnon and Chinnock on the main reason behind the huge premium consumers must pay to get a TV more than 65 inches, but he was also more optimistic for the future, saying several companies, including LG Display, will be making 10.5-generation fabs operational (with the first starting next year) that are optimized for 65- and 75-inch panels. "Those new fabs will be bringing the costs down rapidly for those panels, which should bring TV prices down at those sizes as well." In the meantime, one interesting development that Young pointed to is that the "migration to larger panels is being accelerated by" recent TV price increases since June 2016. He explained that these price increases squeezed the margins for TV brands. "Part of the reason for the tight supply/demand situation at smaller TV panel sizes was a result of the closure of Samsung's 7th gen fab," which was optimized for 40- and 46-inch panels. That situation "encouraged TV brands to sell larger sizes where there is more supply and higher margins, although the sudden drop in supply resulted in shortages and caused price increases across all sizes" in the second half of 2016, he said. Retailers we interviewed in April told us they're seeing strong demand for large-screen TVs as pricing continues to decline, although 65-inch models remain more popular than the larger SKUs. According to Abe Yazdian, the vice president of merchandising for Electronic Express, the retailer is seeing a "huge increase in demand" for big-screen TVs, especially 65-inch models, although there are also a lot more customer requests now for TVs in the 70- to 80-inch range, compared with last year. On the other hand, he told us, his company's 14 stores in Tennessee and one location in Alabama are not seeing so much demand for TVs past the 90-inch mark. One of the main reasons for the increased demand for 65- to 80-inch TVs is that the prices for larger screens are "closing the gap within one size down," so consumers are "seeing the value for the larger screen unless it comes to" a space issue, Yazdian said. Also, the selection of TVs larger than 65 inches has increased from all TV manufacturers. Design changes have also contributed to the increased demand for 75-inch TVs, according to Tom Campbell, CTO and senior technologist at California retailer Video & Audio Center. He explained that, "because of the smaller bezels" on some of the newer 4K models, a 75-inch UHD TV's width has become closer to the size of 65-inch TVs that come with thicker bezels. "We're doing a tremendous amount of business" on TVs 65 inches and up right now, Campbell said, pointing to Sony's first OLED TVs-which come in 55-, 65- and 77-inch SKUs-as an example of new big-screen TVs that he expects will be in strong demand. 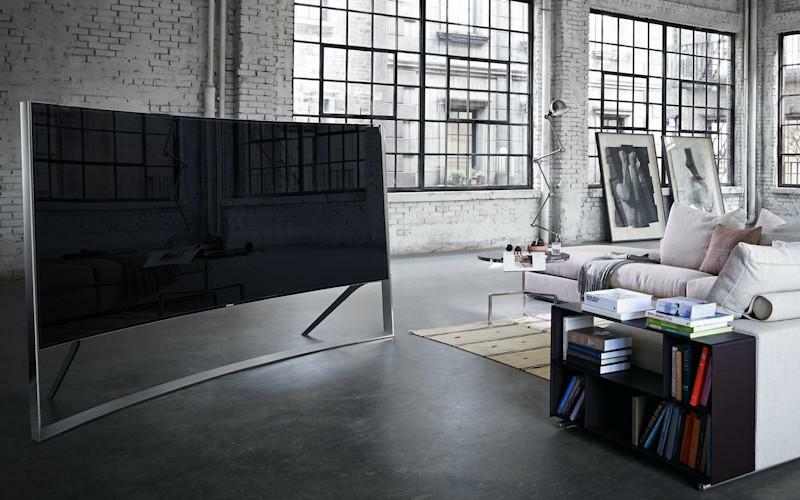 Similar to the Samsung TVs 4K LCD TVs, however, consumers can expect to pay a significant amount of extra moola if they want to step up to larger sizes on the Sony OLED TV line. The $5,498 that Video & Audio Center plans to charge for the 65-inch model is $1,500 more than it plans to charge for the 55-inch SKU. Campbell said his company will also be selling the 77-inch model, but he won't know what that one will cost until it arrives in about June. Sony Electronics didn't offer pricing on the 77-inch SKU when it provided additional details on the line's launch in March. Consumers who want a huge display blanketing their wall have long had another option, beyond TVs: projectors. But "the only reason" that a customer will typically opt for a projection system over a large-screen TV now is if they are looking for a display that's 90 inches or more, Yazdian said. The reason for that is simple: customers in that scenario are getting better value from projectors than TVs when it comes to cost per inch, he said. On the other hand, Rob Kujath, electronics buyer and general manager at Albuquerque retailer Baillio's, said, "We don't do much projection business in New Mexico" because there are "not many basements, and most living spaces are very bright." For Kujath, when it comes to TVs, 65 inches is "definitely the go-to size right now for the main living room TV in our market." He added, "It hits a sweet spot for most consumers [who are] upgrading. It is the combination of a slight increase over their previous" TV that was 55 or 60 inches and "hits a reasonable price point ... When you take the next step [to 75 inches], it is a pretty big price jump." It also takes a good sized room to make a 75-inch or larger TV work, Kujath said, adding that although he sells some 85-inch models, "those are mostly commercial applications." For now, many of Kujath's customers-like most consumers-will likely settle on 65 inches, regardless of their desire to get the largest screen possible. While the premium cost hurdle stopping them from moving up to 75 inches may soon come to an end thanks to the shift to new, next-generation fabs, the space hurdle that prevents many people from moving past 75 inches may prove to be a more stubborn obstacle. • What Will Drive the Sale of 4K TVs This Year? at HomeTheaterReview.com. • Surging 4K Demand Helped TVs Remain King on Black Friday at HomeTheaterReview.com.